Government statistics show that human obesity has reached crisis point, with around two-thirds of people living in Britain either overweight or obese. The problem extends to our pets, one in three household pets is now overweight, which equates to a staggering seven million animals. (PFMA) reveals that an alarming eight out of 10 dog, cat and rabbit owners believe that their pet is just the right weight, although when asked which of a series of pictures most closely resembled their pet, only 33% of dog owners and 23% of cat owners chose the ‘normal weight’ picture. The independent research, conducted by TNS, surveyed over 2,100 households and suggests that nine out of 10 pet owners are not that concerned about their pet’s weight. Most revealing was pet owners’ fundamental misunderstanding about how to manage their pet’s weight. Only a third of cat and dog owners who thought their pet was overweight believed they could do ‘a lot’ about their pet’s weight, but a shocking 62% of dog and 72% of cat owners believed they could personally either do nothing, or a little about their pet’s weight. Of those who thought that their dog, cat or rabbit was overweight, a third (34%) of owners admitted that the reason their pet needed to lose weight was because they fed them too many treats and 11% said that they overfed their pets at mealtimes. A lack of exercise was also cited by 36% of dog, cat and rabbit owners as a cause of their pet’s weight problem. Michael Bellingham, Chief Executive of the PFMA, the principal trade body representing the UK pet food industry, said: “Pet obesity has a serious, and sometimes fatal, impact on the health and welfare of our pets. The figures are alarming and the problem won’t go away without a fundamental shift in owners’ attitude to feeding their pets. It is also worrying that most owners are not aware of the problem, because they are unable to recognise a fat pet in the first place. "Perceptions of what is the correct size are seriously out of kilter with reality. ”Worryingly, only a quarter (25%) of those surveyed said that they had ever sought advice on whether any of their pets were overweight, and when owners were asked how they fed their pets and in particular how they decide on the volume of food they give them, the results were disturbing: 19%, 28%, 21% of dog, cat and rabbit owners admitted using methods of trial and error, indicating a sole reliance on pets’ appetite to determine optimum food portions, while only (24%, 12%, 19%) of owners referred to manufacturers advice on pet food labels and less than a quarter (19%, 15%, 22%) sought advice from vets." Bellingham continued: “Thankfully, there is a solution and we have developed a tool to help owners identify the correct condition of their pet, along with steps to take if a problem exists. Prevention is at the heart of our awareness campaign. Feeding a good diet, and to the correct amount, is fundamental. And so is exercise. We know that a pet fed to its right condition will lead a longer and healthier life. Not only that, getting active with your pet can help pet owners achieve the same for themselves." Diabetes is very common - it affects 1 in every 200 dogs and 1 in every 400 cats, and many of these cases are associated with obesity. It has even been shown that 61% of obese dogs have poor glucose tolerance and high insulin concentrations in their blood (both signs of a pre-diabetic state) long before clinical signs of diabetes, such as increased thirst, occur. 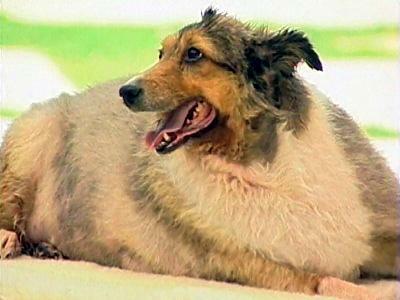 Orthopedic problems are made much worse if an animal is overweight. That isn't surprising because the additional weight puts unnecessary stress and strain on the bio mechanics of limb and joint function. It has been estimated that 24% of obese animals have some form of locomotion problem. Veterinarians have many anecdotal reports about obese animals scheduled to have major surgery for their orthopedic conditions which did not require surgery once they lost weight. Excess body weight increases workload for the heart and almost doubles the risk for circulatory disease to develop. Overweight animals have difficulty exercising because of the effects on locomotion,. and also due to the effects of excess body tissue on respiration - making breathing difficult. Obese animals have altered metabolic rates and their individual "set point" for body weight is higher than it should be. This makes achieving and maintaining weight loss very difficult for owners once obesity is establish ed..